HONOLULU (AP) — Marcus McMaryion could not have envisioned this success when he joined Fresno State four months ago. 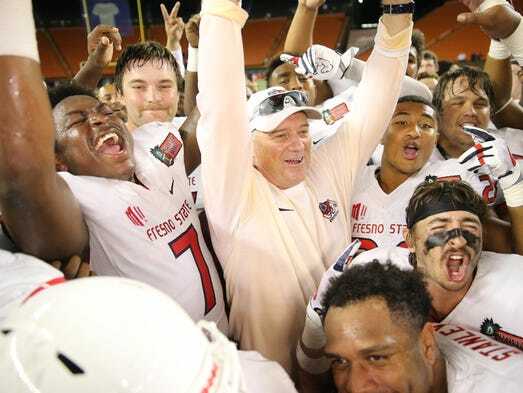 McMaryion threw for a career-best 342 yards and Jimmy Camacho made four field goals to help Fresno State beat Houston 33-27 on Sunday in the Hawaii Bowl. The Oregon State-transfer completed 33 of 48 passes to tie the Hawaii bowl record for completions set by Hawaii’s Colt Brennan against Arizona State in 2006 and also matched by Fresno State’s Derek Carr against SMU in 2012. “I definitely came to just kind of help out and change the program, but I would be lying if I told you that I thought I’d be standing in this position right now, but I’m just glad that I was able to experience it with these guys,” said McMaryion, who joined the team in early August as a junior. “I think I fell into a really good situation. When I got here the guys had the attitude and the work ethic and someone else said that I was just the cherry on top of it. The work ethic and everything was instilled that coach (Jeff) Tedford brought here, so it was just a great year overall and it’s great to finish with a ‘W,’” McMaryion said. The Bulldogs (10-4) had their first 10-win season in five years and completed the biggest turnaround in FBS this season. They went 1-11 last year and became just the second team in FBS history to go from double-digit losses one season to double-digit wins the next. “It’s a great way to end the season here in Hawaii after a great week with win number 10, but it’s all about these kids,” Tedford said. The Cougars (7-5) were seeking their fifth consecutive season of eight or more wins. Camacho was busy in his final game for Fresno State. He attempted six field goals, with makes of 27, 38, 26 and 33 yards, but missed a 56-yarder in the second quarter — which would have been a career long — and had a 24-yard try blocked and returned for a touchdown in the third quarter. Camacho broke the Hawaii Bowl record for field goals. Fresno State finished with 480 yards of total offense to Houston’s 341. Defensive tackle Ed Oliver, the first underclassman to win the Outland Trophy, had his first career carry — a 1-yard touchdown run — to cap Houston’s first scoring drive in the first quarter. Camacho lined up a 24-yard field goal attempt late in the third quarter, but it was blocked by Houston’s Jeremy Winchester and returned 94 yards for a touchdown by Alexander Myres. The Bulldogs took the lead for good on Camacho’s 26-yard field goal with 13:57 left to play and stretched the lead to 26-20 with his 33-yarder with six minutes remaining. Jaron Bryant’s 44-yard interception return for a TD off a deflection with 3:49 wrapped up the win. D’Eriq King’s pass was batted up in the air by defensive end Robert Stanley and fell into the hands of Bryant, who maneuvered his way along the left sideline for the score. KeeSean Johnson caught eight passes for 95 yards for Fresno State and went over the 1,000-yard mark for the season. Steven Dunbar, one of two senior receivers for the Cougars, had seven receptions for 168 yards. McMaryion and Dunbar were selected as the game’s most valuable players for each team. Fresno State: The Bulldogs entered allowing 116.6 rushing yards per game, the fifth-best mark in FBS. They held the Cougars to 72 rush yards — well below their per-game average of 175.5 — on 30 carries, an average of just 2.4 yards per attempt. Houston, which must replace five starters on each side of the ball, will open its 2018 campaign on the road, but not far from home, when it visits Rice on Sept. 1. Fresno State will lose a total of five starters from this year’s squad. It will start off Tedford’s sophomore season at his alma mater at home against Idaho on Sept. 1.